Despite this, there were 32,166 crashes that led to at least one death in the U.S. in 2015. Over the course of one year, crash injuries cost an estimated US$18 billion spent in lifetime medical expenses and $33 billion of lifetime work. That's six times more in medical costs than the U.S. spends annually treating gunshot wounds. These numbers are alarming. It's not a stretch to say that motor vehicle crashes should be viewed as a public health crisis. I have been researching roadway safety for the last five years and have provided expert testimony to state legislative bodies on my findings. 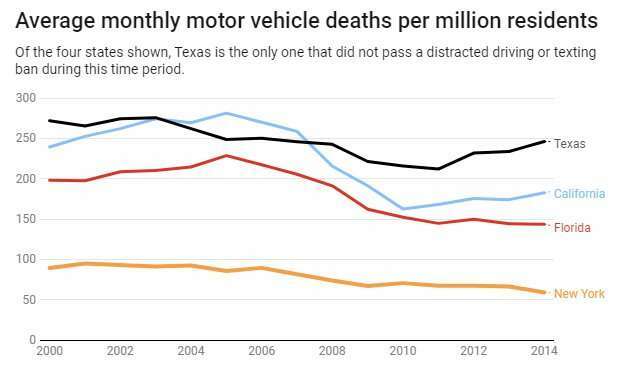 The data show that robust distracted driving policies can make a difference – if states pursue them. Why are there so many crashes when cars and roadways are much improved? Part of the answer lies in a ballooning technological phenomenon: distracted driving. According to the U.S. Department of Transportation, there are three primary types of driver distraction: taking one's hands off the wheel, taking one's eyes off the road and taking one's mind off driving. When a driver interacts with a cellphone – texting, video streaming, emailing – it takes his eyes off the road for several seconds at a time. Research shows that cellphone use while driving can result in longer reaction times, impaired following distance and crashes. That can be injurious, if not deadly. Studies on distracted driving and cellphone use almost always find negative roadway outcomes, such as near-misses, crashes and delayed reaction times. 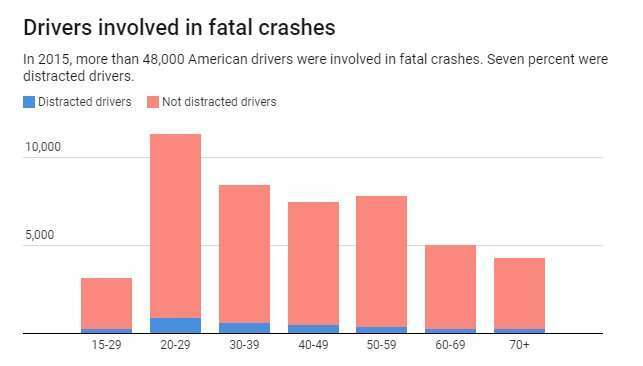 In 2015, 10 percent of all roadway fatalities occurring in the U.S. involved distraction, leading to close to 3,500 deaths and an estimated 391,000 people injured. While distracted driving is prevalent among all ages, drivers between the ages of 15 and 19 were involved in more fatal crashes than those in other age groups. 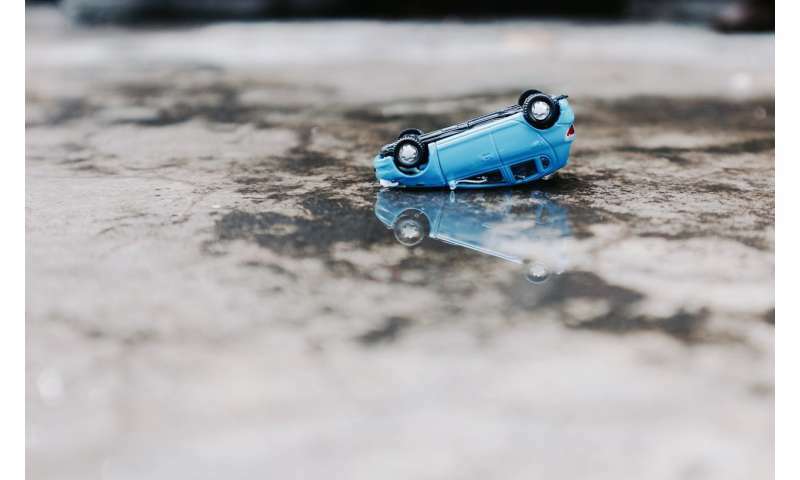 Other major causes for fatal crashes include unfavorable weather conditions, such as fog or snow; drivers' physical impairments, such as drowsiness or heart attacks; aggressive driver behavior; or vehicle failures. Paradoxically, some causes of crashes may seem positive. As the economy improves and gasoline prices drop, more people drive and crash risk increases. In recent years, the U.S. has climbed out of a recession, and the unemployment rate has been on the decline. To tackle the public health threat of coronary heart disease and stroke, states implemented tobacco control laws that prohibit smoking in public places; implemented excise taxes; and allowed Medicaid to cover treatment of tobacco addiction. States have also used legislation to address motor vehicle safety. Common laws include blood alcohol concentration limits; graduated driver licensing programs; and laws mandating the use of seat belts, child safety seats and motorcycle helmets. States have also zeroed in on texting. Today, all states but Montana have passed laws that specifically prohibit texting while driving. The laws generally define texting as the manual composition, reading or sending electronic communications via a portable electronic device. However, all state laws prohibiting texting while driving are not created equal. For example, in some states, an officer cannot stop a driver just for texting – there must be another reason. Moreover, some states, like Indiana, ban texting while driving for young drivers only. In states where officers can stop drivers just for texting, studies show that roadway deaths have gone down by about 3 percent, while hospitalizations decreased about 7 percent. States where an officer must have another reason did not see significant reductions. In fact, among some age groups, these bans were linked to increases in crash-related fatalities and hospitalizations. This is perhaps because people in these states are holding their devices just a little lower than they otherwise would, so as not to be detected. As lawmakers and other stakeholders consider what can be done to further address distracted driving as a public health crisis, enforcement of existing laws is an obvious first step. Given that texting bans are not aggressively enforced widely, it stands to reason that more serious attempts of enforcement may lead to safer roads. Well, like guns, we should just ban automobiles. That'll solve it all. Or at least prohibit them to the mentally deficient half of the population, scofflaws, the underaged, the over aged, ad nauseam. Only we elites should be allowed to have them and use them. The herd needs to be thinned and the weak minded are a good place to start. Not sure why the hell alcohol isn't mentioned here as cause. 1/3 of US crash fatalities involve it. That's the easiest to fix I would say. Laws everywhere should be maximally harsh - any impairment at all leads immediately to interlock device installed in your car at your cost. (Not necessarily permanently, though second offense would be). Problem solved overnight, no jail time, no deaths.